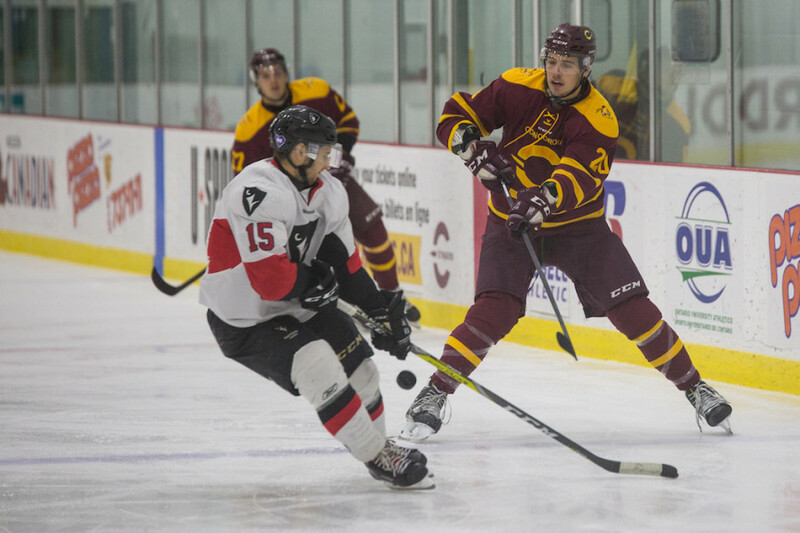 After an emotional shootout win against McGill less than 24 hours earlier, the Concordia Stingers men’s hockey team put their two-game win streak on the line Saturday night against the Carleton Ravens at Ed Meaghar arena. 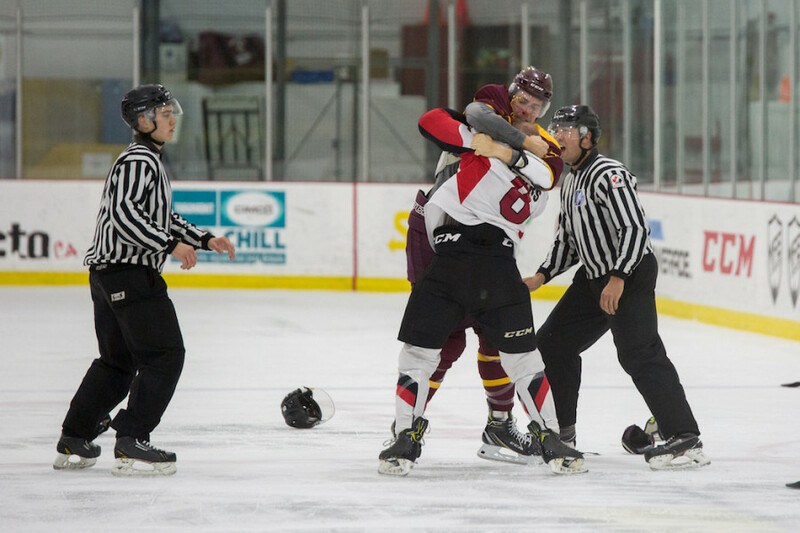 The two teams had collectively served almost the exact same number of penalty minutes this season, Concordia with 476 and Carleton with 478. Those numbers put them in fourth and fifth place in Ontario University Athletics for penalty minutes, respectively. If there could be some sort of embodiment for that statistic, last night’s game was it. Midway through the second period, team captain Phil Hudon took a vicious hit along the boards. His nose bled on the ice and he had to be helped off by teammates and the Stingers’ medical staff. He would not return to the game, but Élément said that he’d be alright and the decision not to bring him back in was a precaution. As he was being tended to by the medical staff, the two teams began cussing each other out from their benches. Even the crowd got into it. “Want a hot dog and a coffee, big boy?” yelled one Stingers fan to Carleton goalie Francois Brassard, who was arguing with Concordia forward Francis Brunelle from across the ice. The Ravens served a whopping ten penalties in the game compared to Concordia’s three. The Stingers held a slim one-goal lead heading into the third period and were looking for an insurance goal, knowing full well that in a game as rough as that one, the smallest threat could lead to scoring opportunities. On an early third period power play, Alexis Pepin scored to give his team that much needed insurance goal. It was his second power play goal of the game. Related: Stingers Win the Corey Cup. “Pepin, the key goals and his presence, his physicality, it’s very important for us,” said Élément, who thought Pepin had the best performance in the game. 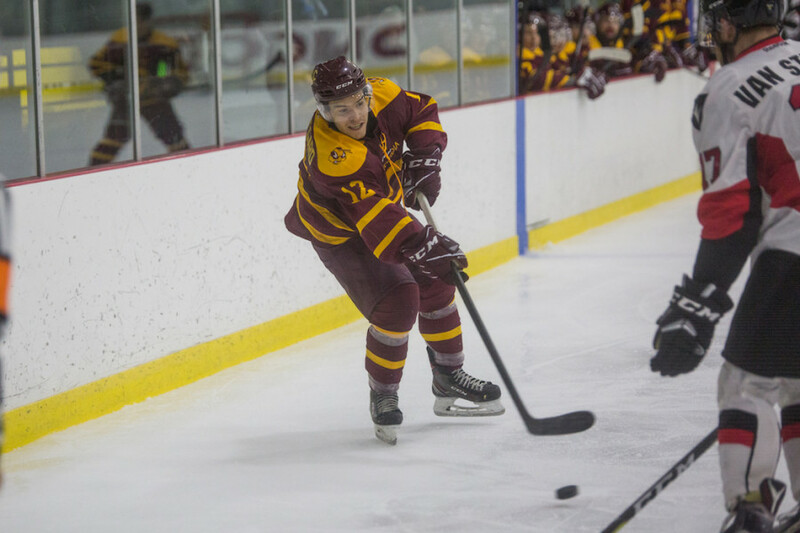 From there, the Stingers added another goal and coasted to a win—their third in a row. The win streak is an exclamation mark on a season that had its highs and lows, but ultimately saw them win 18 games and never drop out of the OUA eastern division standings’ top five. Turcotte was outstanding in the season finale, stopping 25 of the 26 shots sent his way. The win was his fifteenth of the season, good for second in the OUA. “He played 26 games this year out of 28, every night he gives us a chance to win and even tonight was the same thing,” said Élément. Now, the team’s focus shifts to the playoffs. The Stingers finished the season third in their division. Per the OUA’s playoff format, they’ll face the division’s sixth seed, the University of Ontario Institute of Technology Ridgebacks. The teams split their season series at a game apiece, with their most recent meeting resulting in a 5-3 win for the Ridgebacks in Oshawa on Jan. 27. Regardless of their opponent, the team is relieved to be done with the regular season and excited for the playoffs. Concordia’s best-of-three series with the Ridgebacks will begin Feb. 14. By virtue of being the higher seed, the Stingers will have home ice advantage.